THIS ADDITION TO YOUR BIKE WILL NOT ONLY ADD A TOUCH OF CLASS, TO THE RATHER PLAIN FRONT END OF THE MOTORCYCLE, BUT ALSO ADD STRENGTH AND STABILITY. CNC MACHINED FROM "6061" BILLET ALUMINIUM, AND WEIGHING IN AT ONLY 432grams, THIS STABILIZER IS NOT ONLY LIGHT WEIGHT BUT VERY STRONG AND VISUALLY APPEALING. 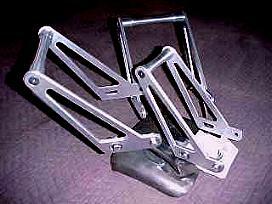 BACK IN THE BEGINNING OF THE EARLY DESIGNING OF THIS PRODUCT WE WERE ASKED CONTINUALLY WHAT IT WAS FOR. 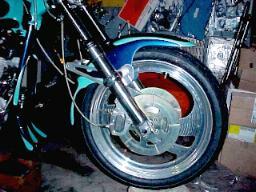 FROM THERE WE WERE REQUESTED TO ADD THESE TO BIKE'S WE WERE BUILDING FOR CUSTOMERS. THERE WERE TIMES WHEN WE ASKED IF THEY KNEW WHAT THE BAR WAS FOR AND THE REPLY WAS OFTEN "NO....BUT IT LOOKS COOL AND I WANT ONE!". WELL...THAT WAS OUR VERY OWN THOUGHTS IN THE BEGINNING TOO. 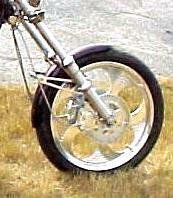 THROUGH OUT OUR R&D WE FOUND THAT THE ONLY BARS AVAILIABLE, TO BE PURCHASED, WERE OF THE STANDARD DESIGN GOING STRAIGHT ACROSS THE FORK TUBES JUST ABOVE THE FENDER. SOME OF THESE DESIGNS HAVE GOTTEN VERY EXOTIC AND STRONG....BUT THERE WAS STILL A NEED FOR SOMETHING NEW.....SOMETHING UNIQUE.......SOMTHING VERY EYE PLEASING BUT YET STILL VERY FUNCTIONABLE. WE AT "PMC" BELIEVE WE HAVE COME UP WITH THAT VERY COMBINATION. HAVING BEEN INSPIRED BY MANY DIFFERENT TYPES OF "DRAG RACE" APPLICATIONS OF THE STABILZER WE BELIEVE THAT OUR NEW "STRONG-BAR" WILL COMPLEMENT NOT ONLY MANY OF THE PRESENT STYLES OF BIKES, BUT ALSO THE NEW AND FUTURISTIC STYLINGS APPEARING IN THE CUSTOM INDUSTRY TODAY. 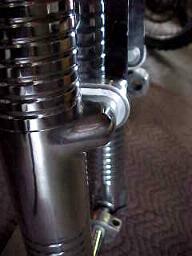 THESE BARS ARE BEAUTIFULLY "CNC" MACHINED WITH SMOOTH CURVES TO MATCH FRONT OF THE FENDER MOUNT TABS. HELD TOGETHER BY STAINLESS STEEL COUNTER SUNK ALLEN BOLTS, THESE BARS WILL RETAIN THEIR APPEARENCE FOR YEARS TO COME! THE CENTER JOINING BAR IS FLAWLESSLY MACHINED WITH A CURVE CONTURED IN TO MATCH THE SWEEPING SHAPE OF THE FRONT FENDER!! 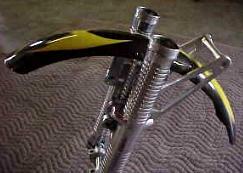 THESE ARE ESPECIALLY GREAT FOR THE LONG CHOPPER FRONTENDS. "JUST WHAT IS THAT THING ON THE FRONT END FOR??" THESE ARE AVAILABLE IN MACHINE FINISH FOR YOU TO PAINT, POWDERCOAT OR POLISH YOURSELF FOR ONLY $75.00.